Jebel Barkal is the current name for the small mountain and its archaeological site situated about 400km north of Khartoum, Sudan. The site lies at the approximate mid-point of the great bend in the Nile River, about 1.5km away on the north bank, beside the present town of Karima. Its 98m-high, flat-topped eminence once marked a primary river crossing on the important north-south overland trade route between central Africa and Egypt (aerial photo courtesy of Timothy Kendall; hover over to enlarge; for site location, see GoogleEarth map below). kingship and that this kingship, granted by Amun of Jebel Barkal, included all of Kush (photo at left © 1985 Timothy Kendall; used with permission; hover over to enlarge). 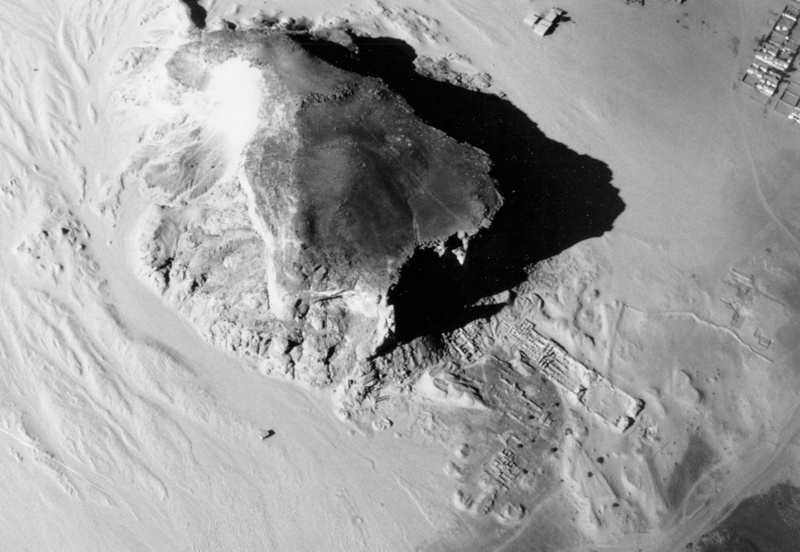 Turn on the "Satellite" view to show the jebel and zoom in a bit to find the temple remains (the largest one is Temple B500). The Egyptian pharaoh Thutmose III (c.1479-1425 BCE) extended his conquests to Jebel Barkal and established it as the southern border of his empire. The city he founded there was called Napata. The Egyptians remained only about 300 years. Later, Napata became the seat of royal authority of an independent Nubian kingdom called Kush, and from about 720 to 660 BCE its kings conquered and ruled Egypt as the 25th Dynasty. Napata was the political capital of Upper Egypt (northward to Memphis) during the late-8th-century reign of Piyankhy (or Piye). Napata and its Amun sanctuary remained the kingdom's chief religious center and the premier site of all royal coronations for several hundred more years. After the Kushites were driven out of Egypt, Napata continued as an important royal residence and religious center until about 350 BCE, when the kingdom finally collapsed. The site continued to be occupied under the Meroitic kingdom and beyond until about 500 CE. For a longer and more detailed history of the site, see the National Corporation of Antiquities and Museums (NCAM), Sudan Website. Jebel Barkal is one of the largest archaeological sites in Sudan (hover over the plan to enlarge). The sanctuary in front of the mountain contains at least 24 important buildings (including at least 13 temples, several chapels and kiosks, and at least three palaces), of which 11 have thus far been excavated. To the west of the jebel is a field of royal pyramids, which are among the best preserved in Sudan. an ancient town and temple site 5km downstream on the opposite, left, bank of the Nile, within the bounds of the modern town of Merowe); Duweim Wad Hajj (an unexcavated ancient temple[?] site on the left bank, directly opposite Jebel Barkal and overbuilt by a very old mosque); el-Kurru (the cemetery of most of the kings and queens of the 25th Dynasty and their ancestors from c.900-650 BCE); Nuri (the site of the pyramid of Taharqo [c.690-664 BCE] and those of his successors and queens during the Napatan Period, c.650-270 BCE); Hillat el-Arab (the site of a series of Egyptian or elite early Kushite rock-cut tombs from about 1000-750 BCE); Tangasi and Zuma (sites of monumental post-Meroitic tumulus graves dating c.350-500 CE); el-Ghazali (an early Christian monastery, c.700-1000 CE); and Merowe Sheriq (a massive medieval Christian fortress c.1000-1400 CE, whose walls incorporate blocks from much earlier Egyptian and Kushite buildings). The extensive remains at Jebel Barkal were first observed and described by European explorers in the 1820s, but it was not until 1916 that the first major excavations were undertaken, by George A. Reisner and the joint Harvard University / Museum of Fine Arts, Boston, Expedition. Reisner cleared nine buildings at the site and assigned them each a 100-number, prefaced by the letter B (for Barkal). From the 1970s to the present, excavations have continued by a team from the University of Rome, under the direction of Sergio Donadoni, which was joined in the 1980s by another team from the Boston museum, under the direction of Timothy Kendall. Kendall continues to excavate the site, now under the auspices of the Qatar-Sudan Archaeological Project. 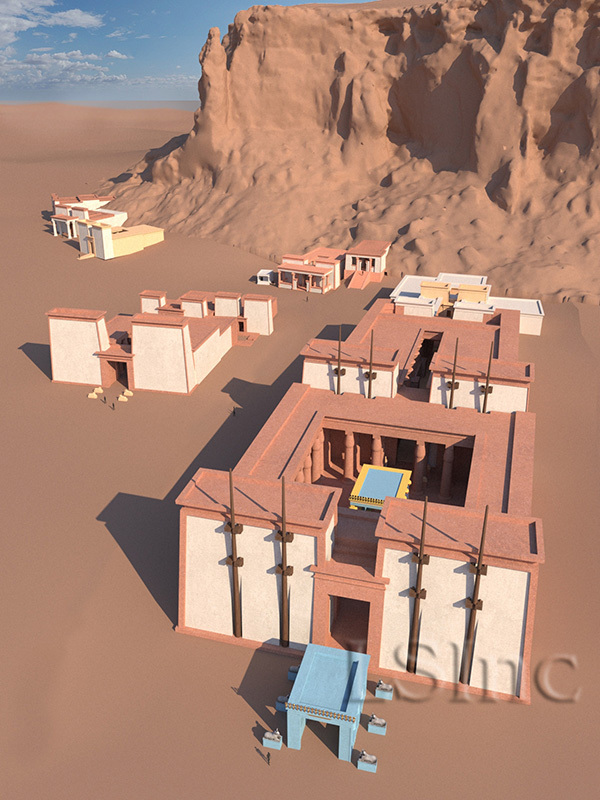 LEARNING SITES has been working with Timothy Kendall since the mid-1990s to reconstruct the site digitally, one structure at a time (the preliminary site model at the left, created in 2015, shows progress so far; much of the model is untextured as we continue to research wall decoration and color schemes; hover over to enlarge). 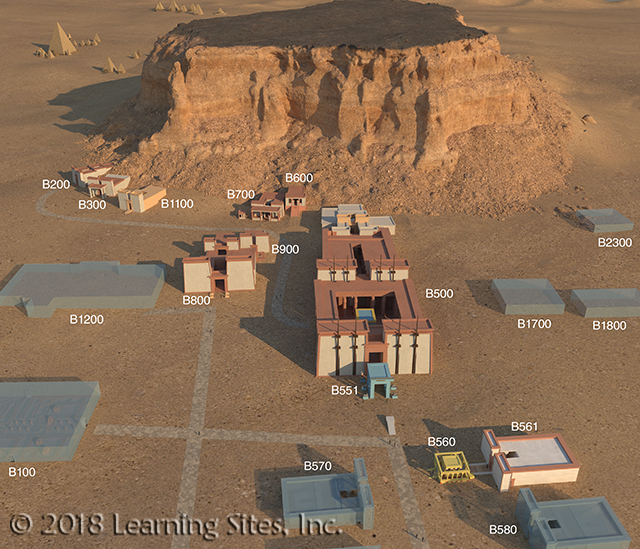 The resulting 3D models, high-resolution animations, and virtual worlds will be first used as research tools for better understanding the function of the site and its many buildings. Subsequently, the material will be made available as a digital publication of the site's excavations, and for museum display kiosks and educational materials. In 2006, LEARNING SITES' flyover of Jebel Barkal was featured in a program on ancient Sudan for Japanese TV produced by Nexent; our early 3D models of the site were used for a program on Dutch TV in 2000; and numerous renderings from our reconstructions have appeared in journals, magazines, and newspaper articles around the world over the past 20 years. Bonnet, Charles & Dominique Valbelle. 2006 The Nubian Pharaohs: Black Kings on the Nile. Cairo and New York: The American University in Cairo Press. 2009 "Talatat Architecture at Jebel Barkal," Sudan & Nubia 13:2-16, pls. I-VIII. 1997 "Report of the 1997 Season at Gebel Barkal," Newsletter of the American Research Center in Egypt 175:1-12. 1990 The Gebel Barkal Temples 1989-90: A Progress Report on the Work of the Museum of Fine Arts, Boston, Sudan Mission. Geneva: 7th International Conference for Nubian Studies, 3-8 Sept.
1988 "Gebel Barkal Temples, Karima, Sudan. 1987 Season, Museum of Fine Arts Boston." Institute of Art and Archaeology Newsletter. Memphis, TN: Memphis State University, pp.10-18. 1931 "Inscribed Monuments from Gebel Barkal." Zeitschrift fur Agyptische Sprache und Altertumskunde 6:76-100. 1918 "The Barkal Temples in 1916 [Part II]," Journal of Egyptian Archaeology 5:99-112. 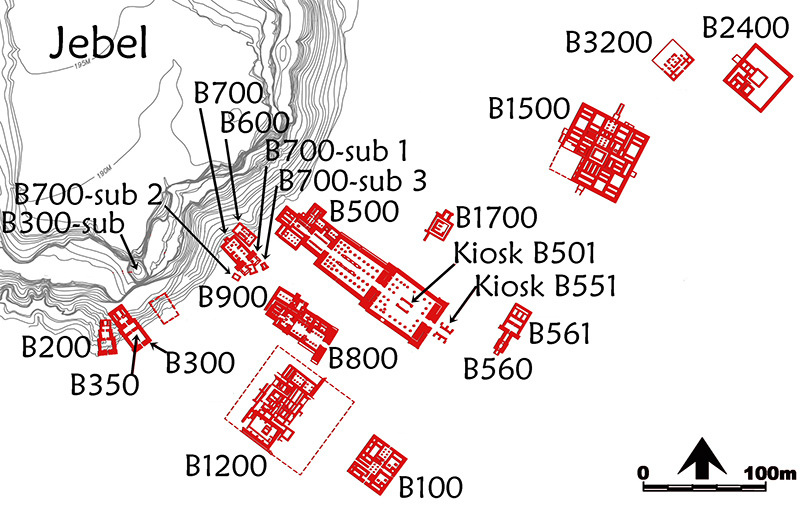 2008 Amun Temples in Nubia: A typological study of New Kingdom, Napatan, and Meroitic Temples. (BAR International Series 1850). Oxford.